The best way to learn the Nautical Rules of the Road. NavRules provides all the questions, answers, explanations and resources to help you master the Nautical Rules of the road. For all mariners, from kayakers to ship captains. 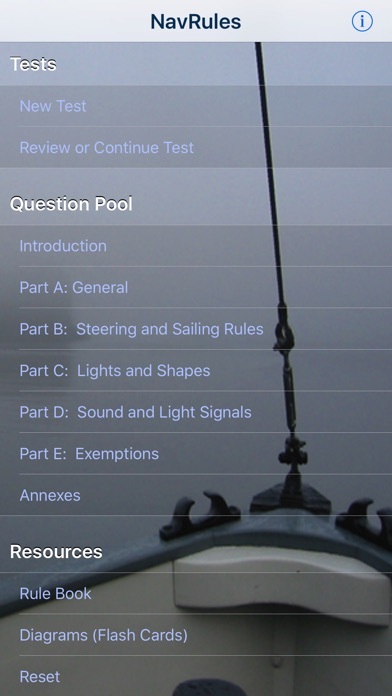 Product Description: Based on the International and US Inland Navigation Rules along with the published edition of the USCG database of license exam questions, this App helps you master the Navigation Rules using a practice exam driven methodology. Using NavRules you generate practice exams where you: • control the number of questions, • control the scope of the questions (international vs inland), • specify a filter (a text string that must appear in the question), • specify the rule the questions pertain to, • identify whether the question has been previously answered or not, or answered incorrectly or not. This gives you control over the tests that are generated so you can focus your learning experience. After taking an exam you can review the results to see: • which questions were answered correctly, • for incorrect answers the correct answer, • the rule the question pertains to so you can understand the context of the question. Every practice exam you take tracks your results relative the the Navigation Rules Question Pool. By browsing the Question Pool you can see your progress on understanding each rule. 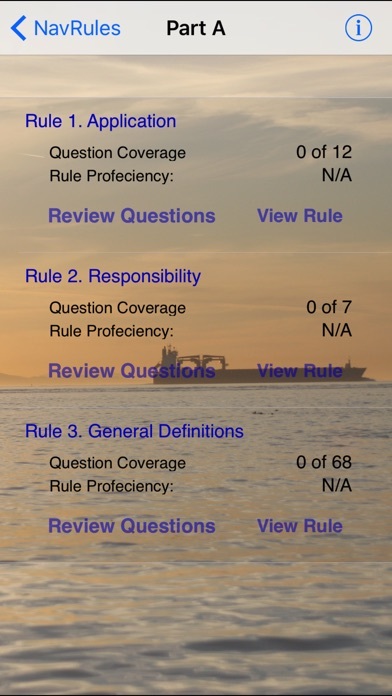 For each rule NavRules reposts: • your coverage (number of questions you have answered) and, • your proficiency (the percentage of questions you have answered correctly). If you want to study a rule you can link directly to the questions related to that rule and choose the answers. In this "review" mode you get immediate feedback on whether your answer is correct (but these results are not recorded and do not impact your rule coverage or proficiency). The Flash Card mode lets you see all the diagrams used in the tests and from each of them see the questions that reference that diagram. 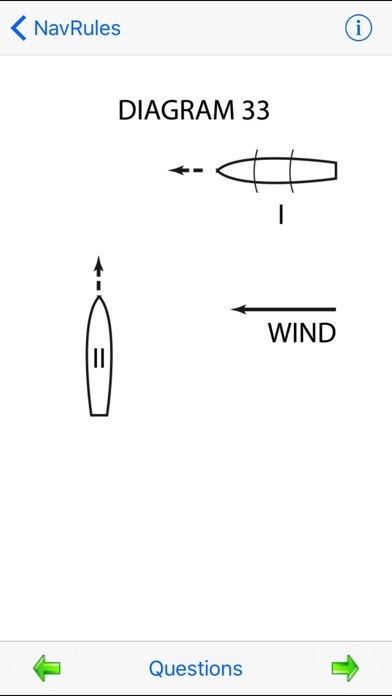 The included Rule Book provides: • index to US Inland, International and Canadian Rules, • link to all illustrations used in the Navigation Rules, • link to all vessel lights by vessel type, • definitions, • demarcation lines, • special terminology, • distress signals • references. Other features include: • over 1200 answered and referenced questions on the Navigation Rules, • complete copy of the Navigation Rules, • custom design your practice tests by number, filter, and type so you can focus on what you need to learn, • rules are clearly identified as Inland and International or both, • all practice tests results are stored until manually deleted, • Canadian Modifications to the Navigation Rules. So helpful for all members of the bridge team. There is no substitute! Best tool for studying ROTR! I am a US Navy Captain Surface Warfare Officer (SWO) who continues to expand my knowledge as a professional mariner with this and other tools from the pros at Starpath. This intuitive product is easy to use and fully up to date with the latest version of the new Nav Rules and Regulations Handbook (supercedes COMDTINST M16672.2D). A couple of features that are invaluable: the "filter" function lets you filter out portions of the test bank by keyword, e.g., if your course won't test you on Western Rivers, you can filter sample questions for the word "western". Also, after taking several practice tests over time, you can filter the next test to only give you questions that you missed on previous attempts. I had one question in which I thought the test database was incorrect. I used the "helpdesk" email and received a response from the head of Starpath, Dr. Burch himself, who tactfully showed me that the error was mine, pointing me to the specific page in the new rule book where i had overlooked the answer! The full app is a great resource for any Navy or Merchant Mariner to keep up the critical skills that are fundamental to our professions. BZ to Starpath! Get the Upgrade App rather than this one. Upgrade is laid out more like an exam and has less incorrect answers. This is also only the rules of the the road as other apps have all sections to take. Short story: Great app - well worth the price. Long story - I was a little hesitant to purchase the app after the reviews about how the questions are inaccurate. 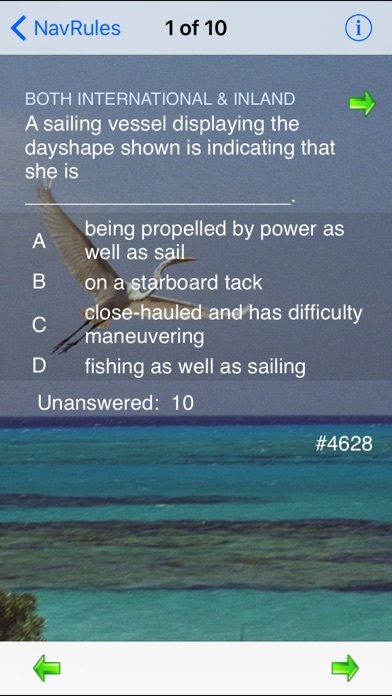 Therefore, when I take tests on the app and I see something that looks odd I check the answer against the USCG test bank. I can’t speak for the last several people who have reviewed the app, but the official USCG and this test have always matched except 1 anomaly and I e-mailed the company to inquire. I got a response back immediately that they were looking into it and a day later explained that the answer had been updated in the last version of the USCG testing bank and they would incorporate that answer into their next version as well. 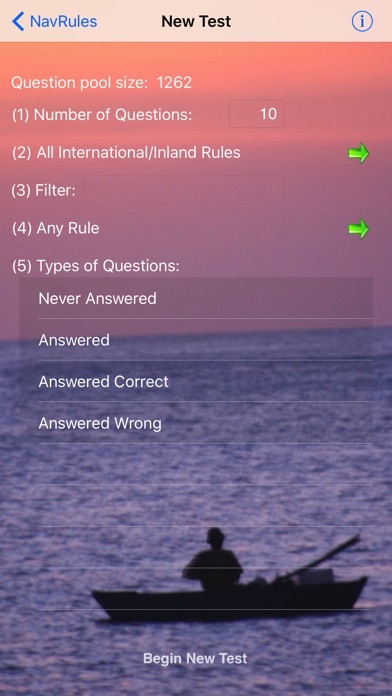 Bottom line - questions and answers match the USCG test perfectly well, customer service is fast in case you do doubt an answer, and the app is well worth it if you have to study for an RoR test. Would be 5 stars... But for an app that claims to help you get ready for the Rules of the Road test, some wrong answers are just not acceptable. Most of the wrong answers I found were in the lights section. Good app to help you get a feel for the test, but very unreliable to actually get you to PASS. Not all the answers are correct which defeats the purpose!!!!! This is the most legitimate app I've ever bought in my life. It has everything you need including over 1000 DWO questions for practice tests, as well as a digital version of the navigation rules (diagrams included). You can break tests down into subsections if you struggle with one part. I used this app for 03 days and got a 98% on the test. I highly recommend this app. Really good app with great interface. Wish there was more questions though. I ended up going through them all quickly but I'm willing to admit I may be a special case.